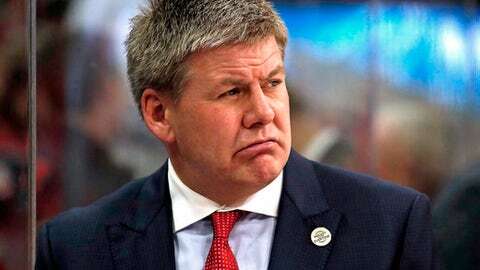 RALEIGH, N.C. (AP) Bill Peters has not been able to lead the Carolina Hurricanes back to the NHL playoffs and after coming up short following his fourth season with the club, announced Friday that he is resigning. Peters went 137-138-53 in his lone head coaching job in the NHL. He had one season left on the contract extension he signed in 2016. The move leaves the Hurricanes looking for a new general manager and head coach. Hall of Fame player Ron Francis was reassigned to another front-office position during the season. ”I feel the incoming general manager should have the ability to hire his own head coach,” said Peters, who was hired by Francis in 2014. The 53-year-old Peters figures to be a candidate for other openings around the league – including a team in his home province. The Calgary Flames fired Glen Gulutzan earlier this week after missing the playoffs in his second season. Peters is a native of Three Hills, Alberta, who played college hockey in that province at Red Deer College under coach Mike Babcock – who eventually hired him as an assistant with the Detroit Red Wings. Peters left the Red Wings’ staff four years ago to take his first NHL head coaching job with Carolina, but was unable to end the team’s playoff drought, which at nine years is one of the longest in NHL history. The Hurricanes have made the postseason just once since winning the Stanley Cup in 2006, and just twice in 15 seasons. This will be their third coaching change since their last playoff appearance in 2009. Expected to be a playoff team this season, Carolina finished 14 points out of a postseason spot and in sixth place in the eight-team Metropolitan Division. There’s been plenty of change over the past four months for the Hurricanes, who will have turnover in three key spots on the organizational roster. Longtime owner Peter Karmanos Jr. sold the majority interest in the team to Dundon in January, and the Dallas billionaire shook things up when he reassigned Francis to the role of president of hockey operations. The new GM will report directly to Dundon. Peters’ frustration became evident following a critical 3-1 loss to San Jose in February that cost them a chance to move into playoff position. After that game, Peters called his team out, repeatedly using the word ”disappointing” while promising lineup changes that ultimately never came.